Amanda Coleman Archives - Pebbles, Inc.
Hello everyone! Amanda here today. One of my favorite ways to use paper is to make plants and planters. They are easy to make and require no maintenance. Just my type of plant! Luckily for you and me, succulents are still trending, and it is no wonder why. They are cute, exotic, small, and easy to care for. 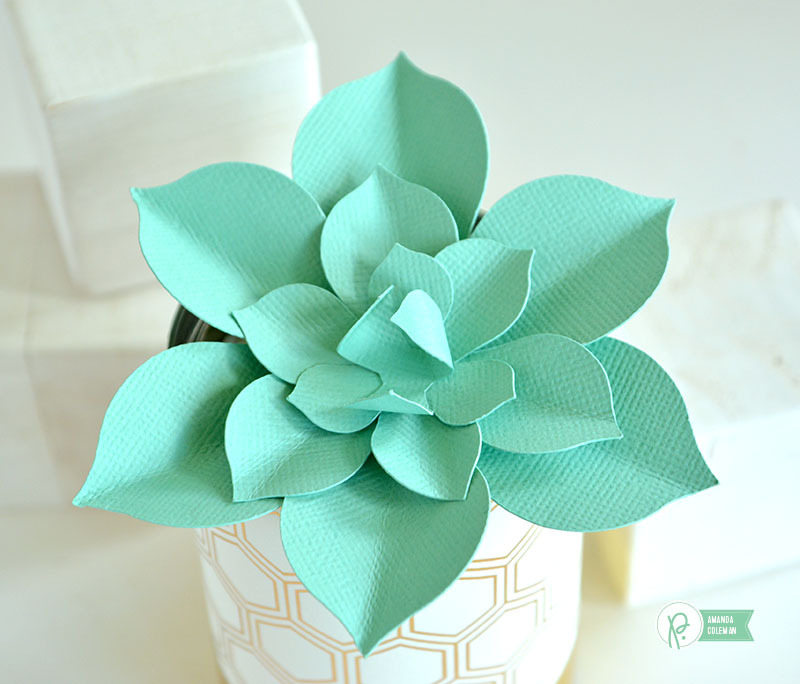 Whether or not you have a green thumb, you can brighten up your space by making some paper succulents in no time. 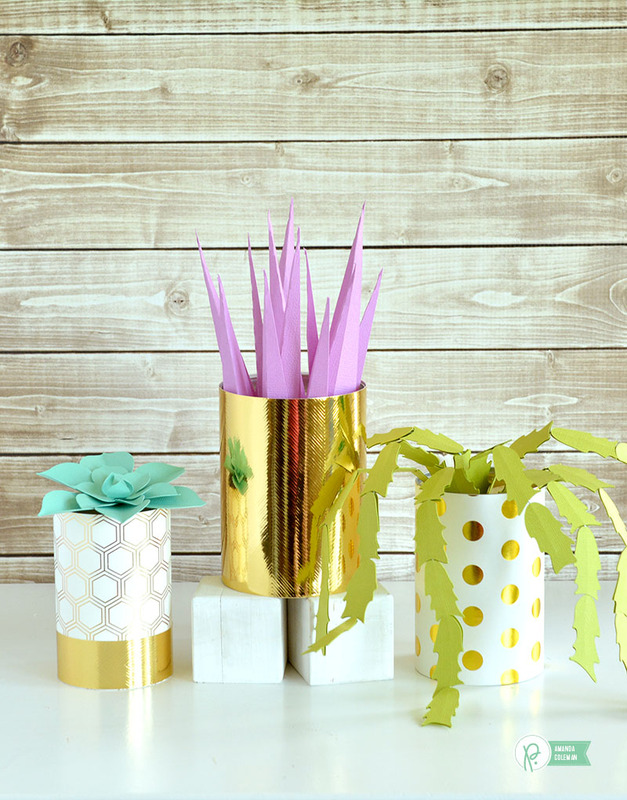 Upcycle some cans by wrapping them in some bright gold foiled papers and you’ll have some superb decor on your hands. 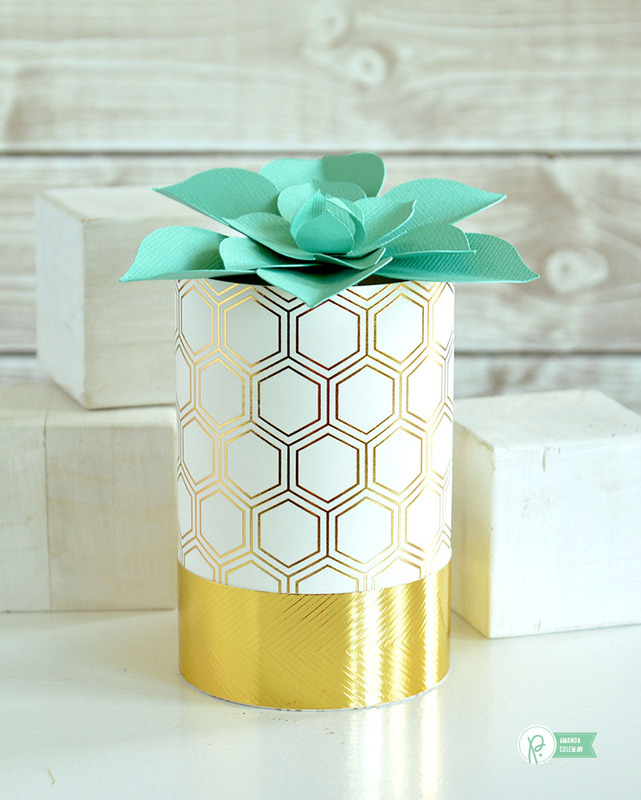 Gold foiled specialty papers from Pebbles are my favorite for making home decor items. I used two different papers and wrapped them around this regular ol’ can to create a bright and trendy succulent “planter”. Have fun with the colors of your succulents. Create an off-beat color scheme or one that matches your decor. That’s the beauty of creating paper plants. Using textured cardstock gives the plants a more life-like feel, too. These gold polka dots are my favorite. My favorite pencil cup is wrapped in the exact same paper. 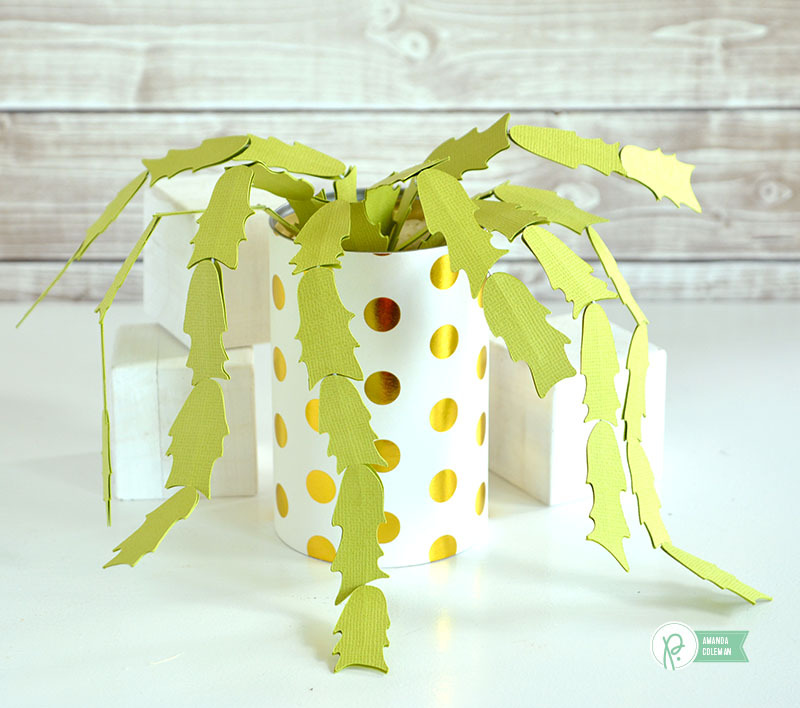 To make this Christmas cactus, die cut two of each piece and adhere on both sides of a narrow gauge floral wire. This will allow you to bend and twist the limbs until they are just right. Plant your paper succulents in a container full of rice. 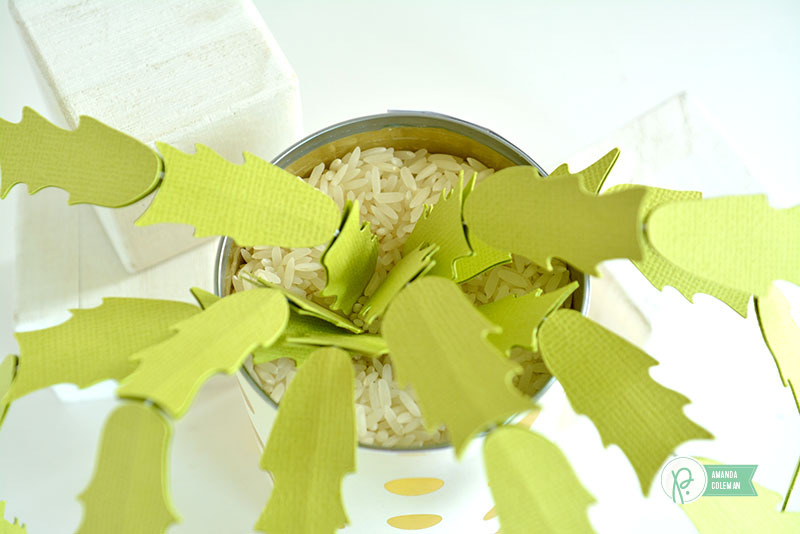 It makes it easy to rearrange your plants and the weight of the rice holds the container in place. Want more fun ideas for upcycling or repurposing cans? Click HERE or stop by the Pebbles Blog and search “upcycle” in the search bar. Hello friends! Amanda here today. Thank you for stopping by the Pebbles blog. 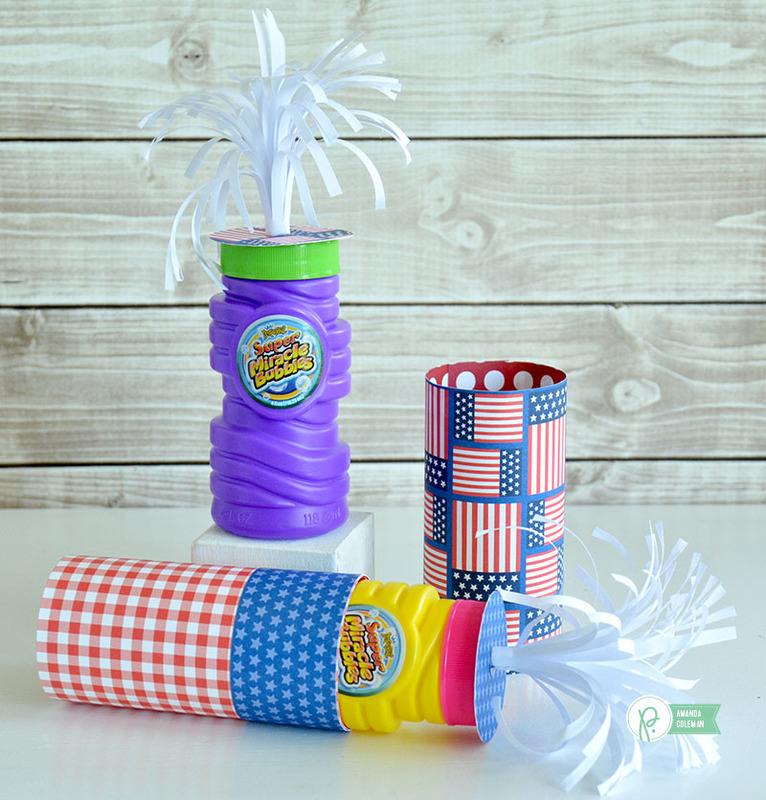 Today’s project is trendy, fun, easy, and inexpensive–my specialty! I am still smitten by the pineapple trend. They are just so bright and colorful. They are perfect for summer and super cheery in winter. 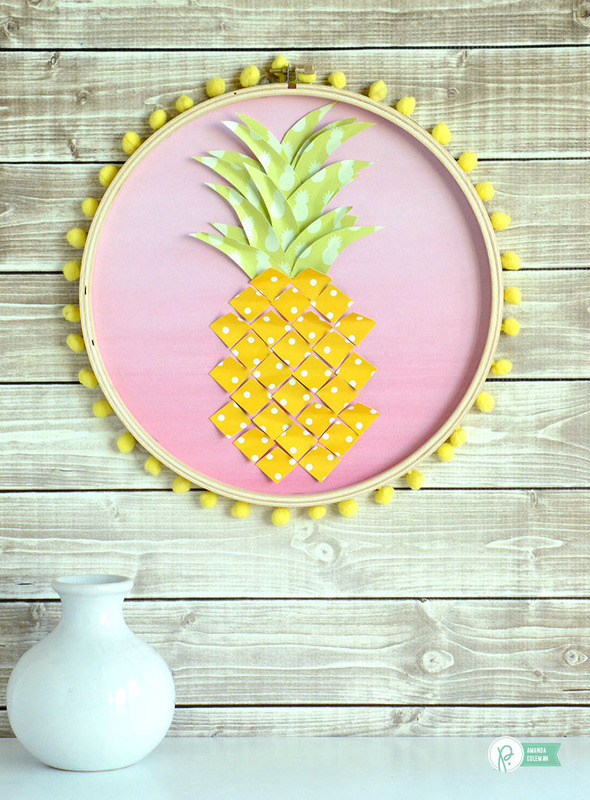 This DIY pineapple hoop decor would be perfect year-round! 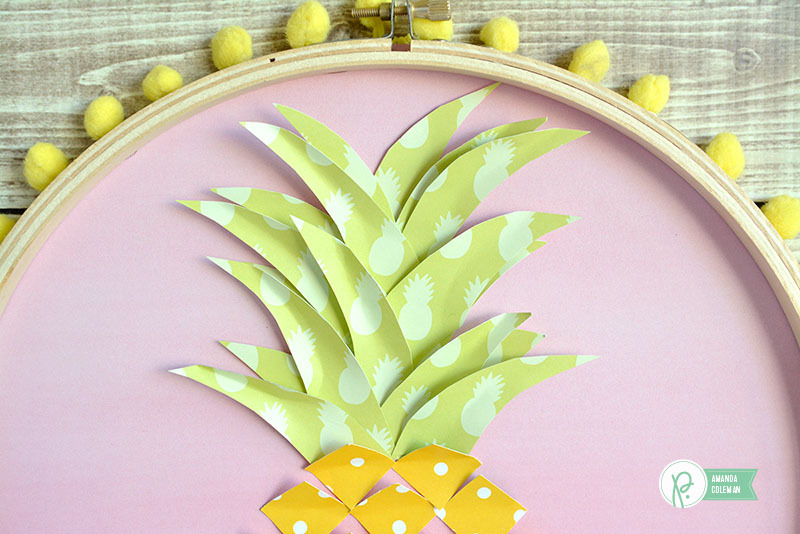 Making the pineapple is as easy as it looks. I punched out 3/4″ squares, gently bent them on the diagonal and adhered them to the paper with tiny glue dots. You could make a mini pineapple with small squares, or a giant pineapple with extra large squares. 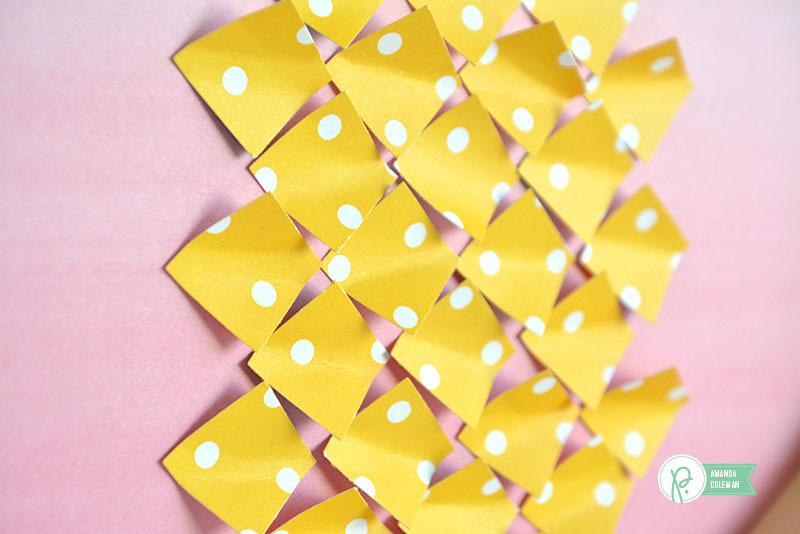 Making the leaves was just as easy as punching the yellow squares. I free-hand cut several spiky leaves and alternately arranged them starting at the top of the hoop. I added a few leaves here-and-there to add more texture to the leaves. I also bent the leaves slightly to add dimension. And I couldn’t resist a cute pom-pom border. 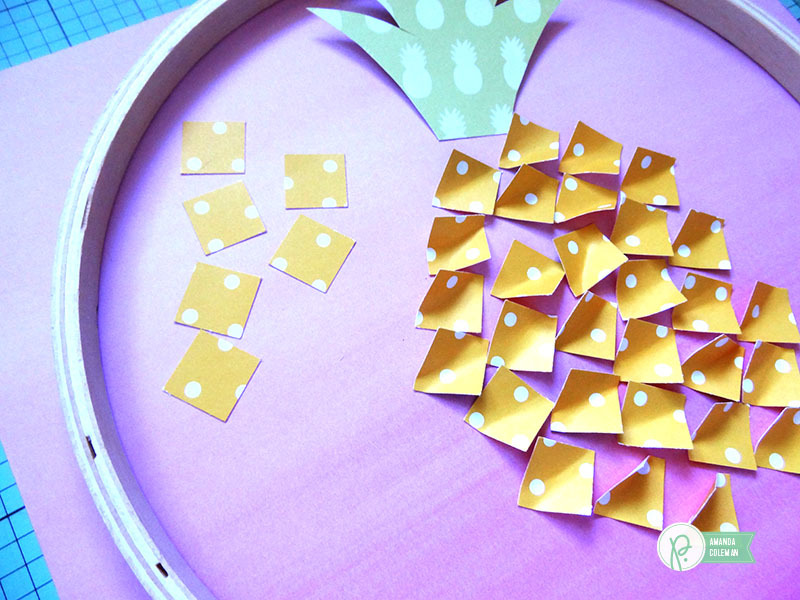 To make the pineapple, start by punching or cutting several 3/4″ squares. You can also vary the size of the square depending on your project. Gently fold the squares to give them some dimension. 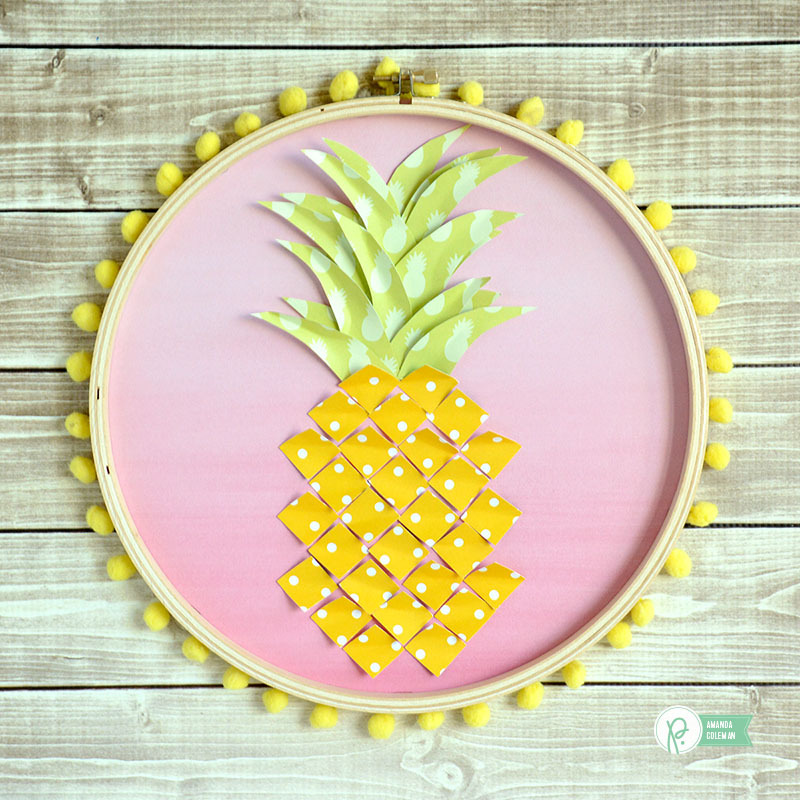 Experiment with the arrangement and size of the pineapple inside of your embroidery hoop until you make one that works perfectly with your project. Free-hand cut some leaves to size. 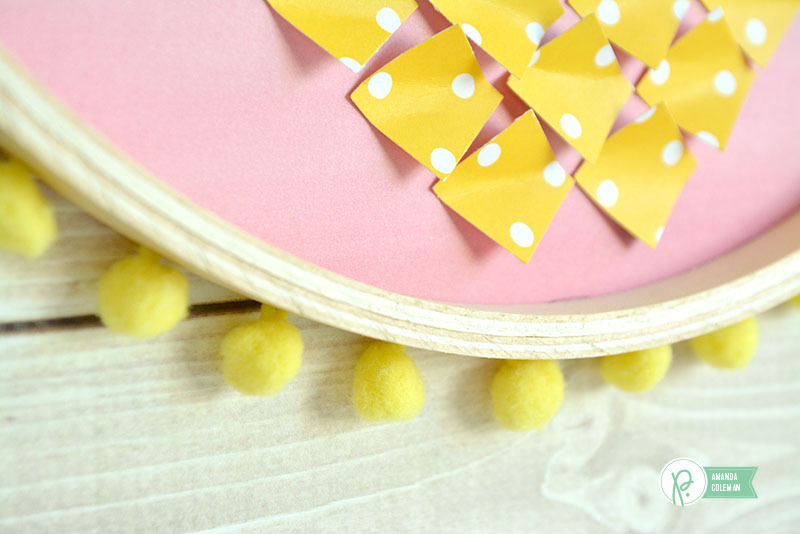 Adhere pom pom trim to the back of the hoop with a small bead of hot glue. 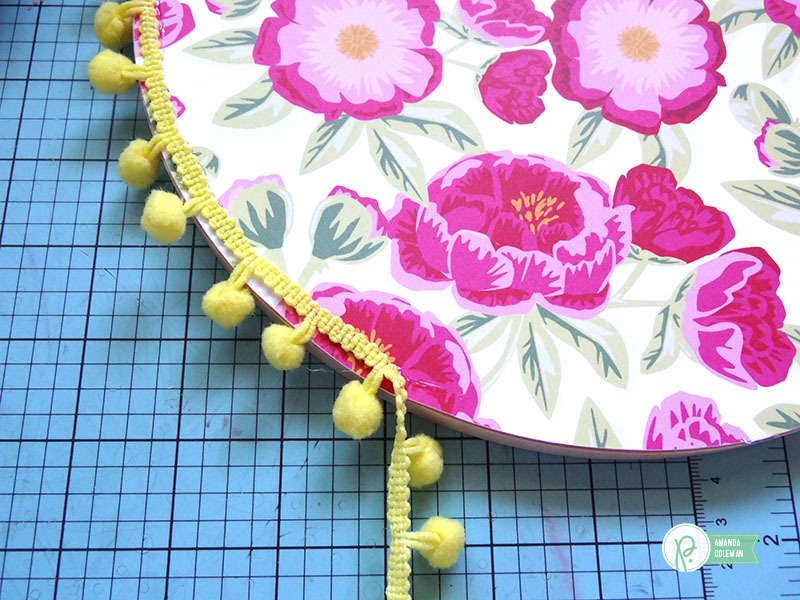 Want more embroidery hoop ideas? Click HERE or search “hoop” on the Pebbles blog. Happy July! Hello everyone! Amanda here today. I can’t think of anything more iconic on the Fourth of July than fireworks. Most of us wait all year long eagerly awaiting the spectacle as we sit with our family on a blanket. 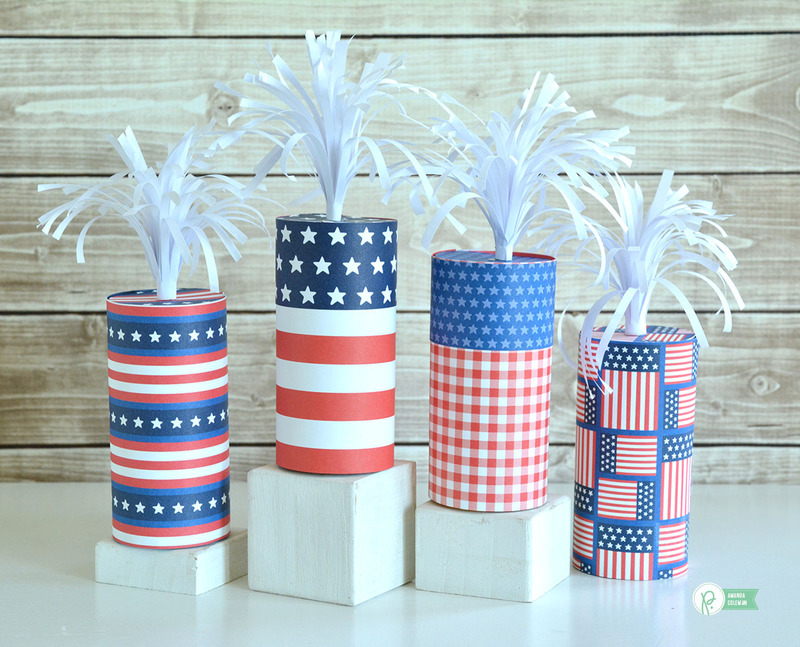 Bring fireworks indoors or to a party by creating these delightfully simple firecracker gifts. Not only are these festive holiday firecrackers super fun all on their own, they hide a special gift inside. Any guesses? They come together in a snap and would make fun party favors or home decor. Bubbles! Who doesn’t like bubbles in the summertime? I thought my kids, ages 9 and 12, would be indifferent but they couldn’t wait to get their hands on these bubbles. Simply push the bubbles up from the bottom of the paper tube like a push pop. 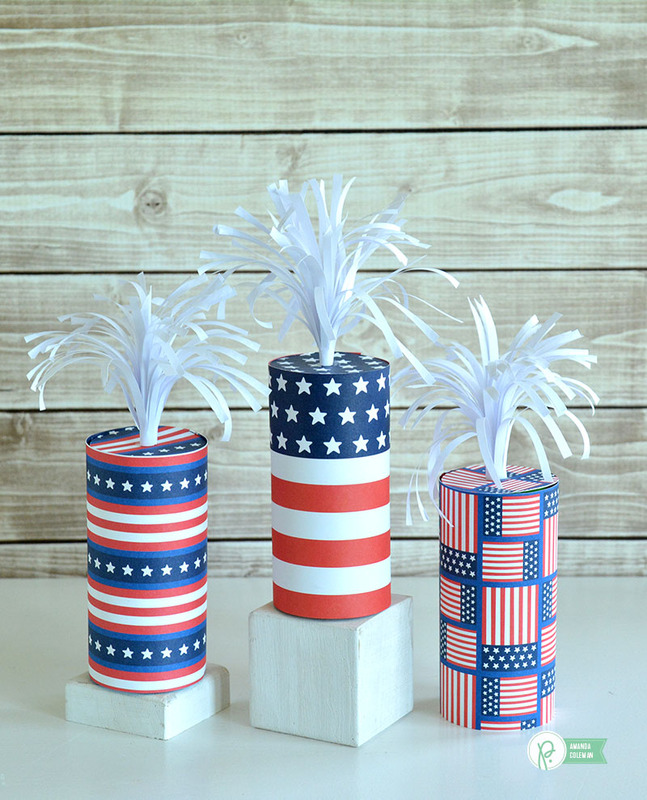 Top each firecracker with a fringed paper spray. They are seriously one of the most fun things I have made in a while and they are take no time at all. Each bottle of bubbles is wrapped with a piece of patterned paper or two. 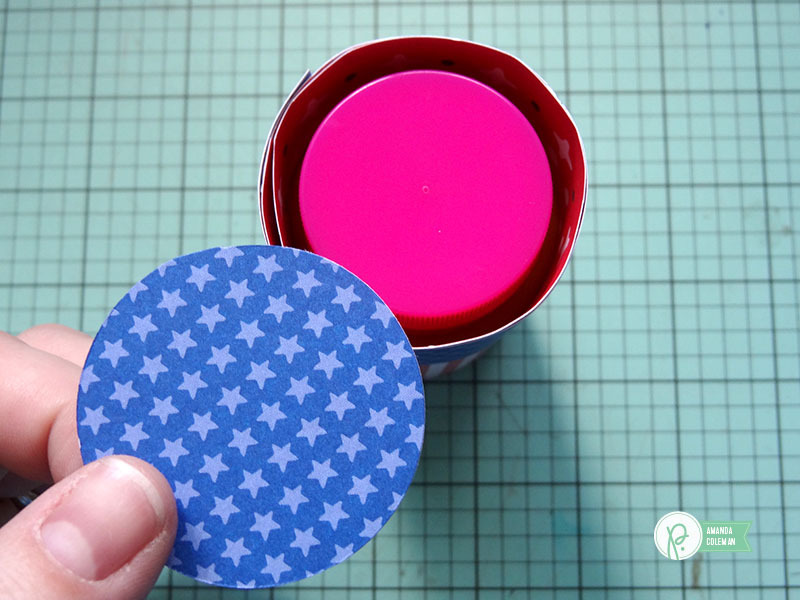 Cut the paper to size depending on the size of your bubble container. Measure the diameter for the top after you have wrapped your bubbles with a strip of paper. Use a piece of regular ol’ white copy paper to make the fringe. Punch or cut a circle that is the same diameter as your tube and adhere to the top of the bubbles container. This makes the firecracker look complete while still giving you access to your bubbles. 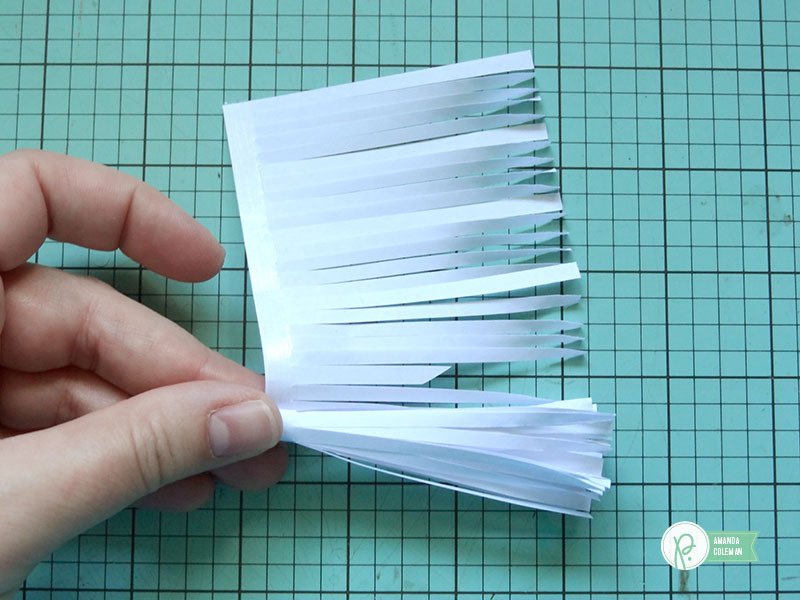 Make the fringed paper spray by cutting fringe into a 8 1/2″ x 3″ piece of plain white copy paper. 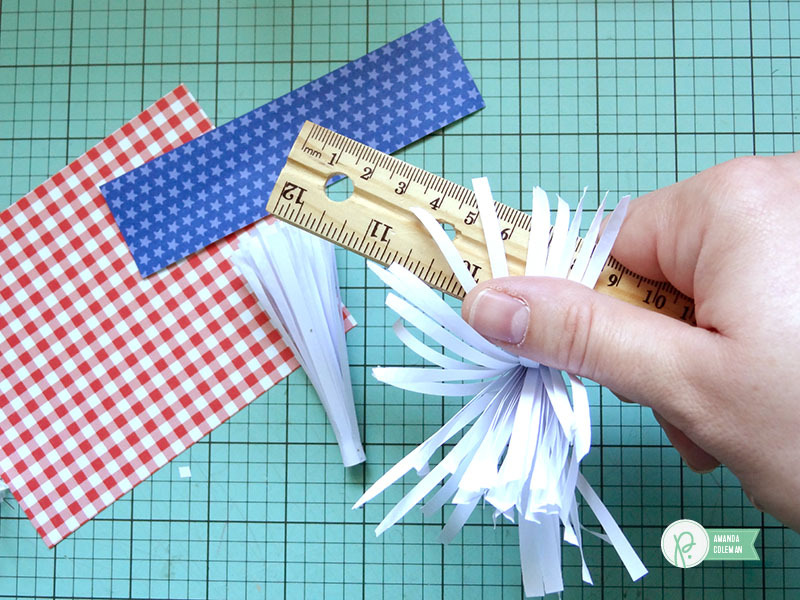 Fringe scissors will make this task go super quickly, but a pair of regular scissors will work just as great. Apply adhesive to the end of the strip before rolling up your fringe. Starting at one end, roll your fringe into a single bundle. At first, your fringed paper spray will look stiff and boring. Create gentle curls in your fringe by gently pulling the fringe between your thumb and a ruler just like you would use scissors to curl gift ribbon. 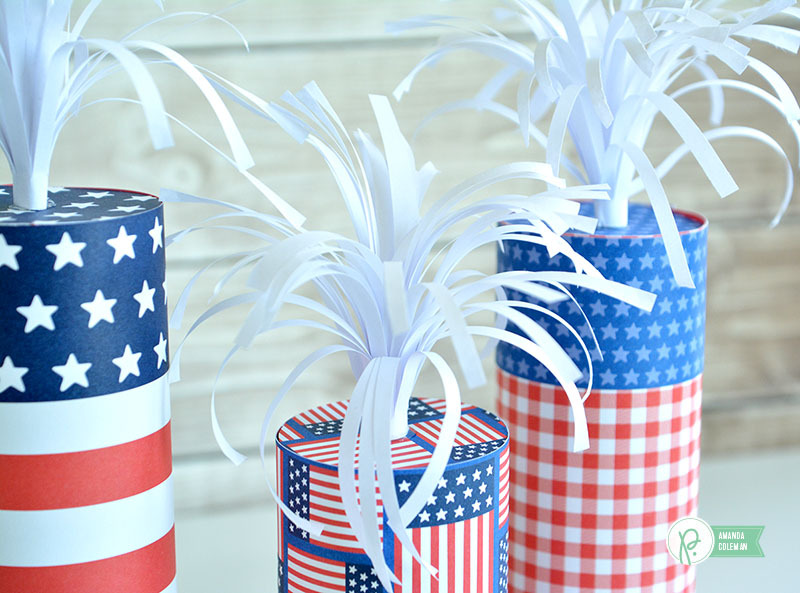 Adhere the fringed paper sprays to the top of the firecracker with a glue dot and they’re ready for the party! Have a fun and safe Fourth of July! Hello everyone! Amanda here today. Trying to come up with a Father’s Day gift other than black socks or a new tie is a challenge for us every year. Sure, dad always wants the latest and greatest in technology, but the reality is that it’s not always a possibility. Around here we know that a simple, thoughtful gift still means the world to dad. 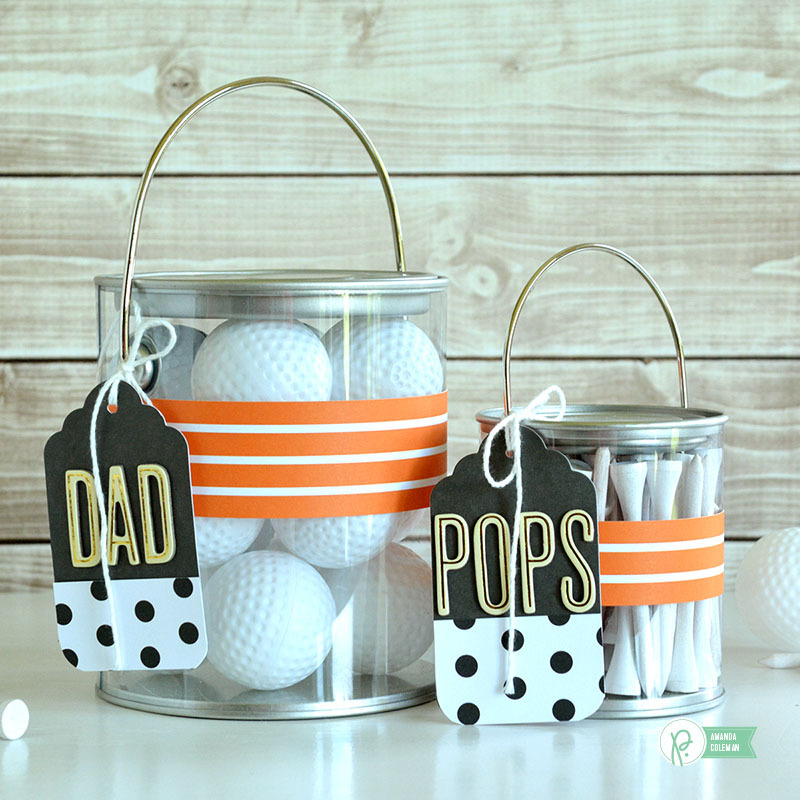 Give the gift of dad’s favorite hobby by filling a couple of containers with some golf balls and tees. Showcasing the shiny, new equipment in some clear containers is a fun and easy way to present the gift. 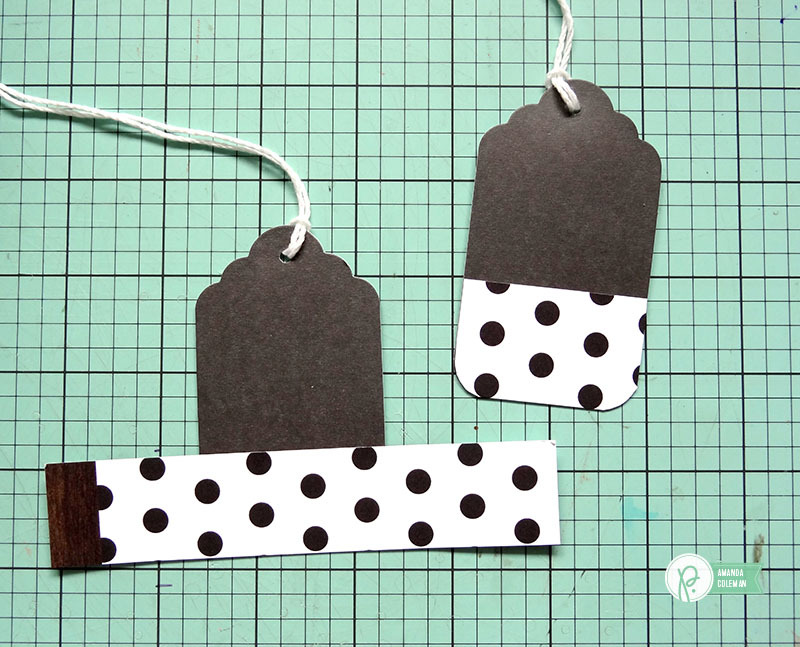 Wrap the containers with a strip of paper, add a simple, customized tag and they’re ready to go. At a loss for words? 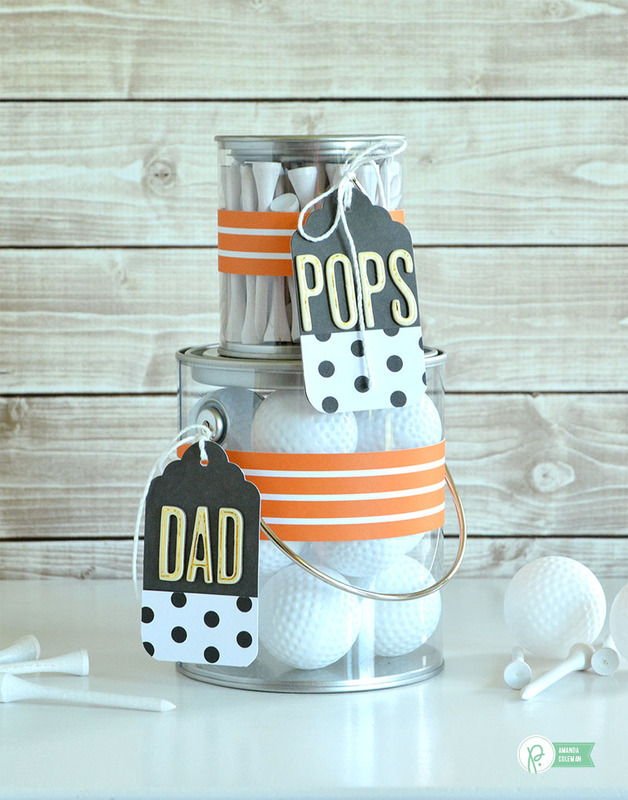 Create a simple tag by spelling out dad’s name with some Thickers. 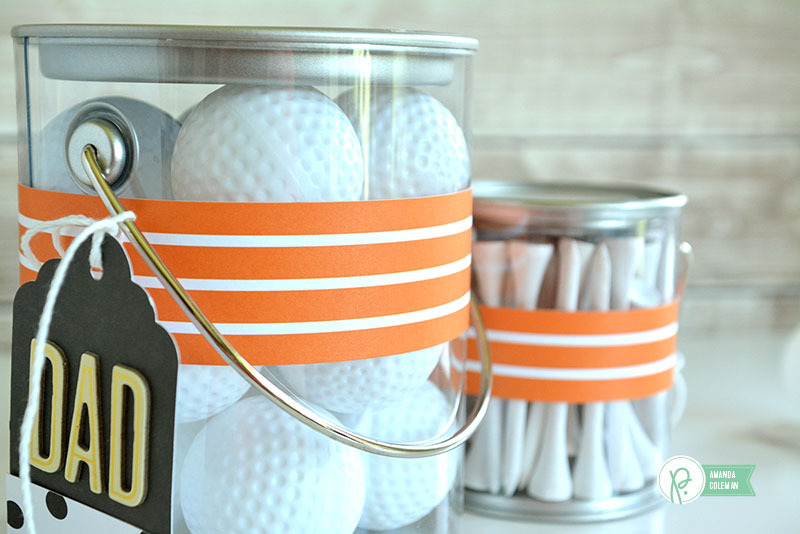 Reminiscent of retro tube socks, the orange stripes from the Citrus patterned paper add a sporty touch to the golf ball and tee canisters. It kinda makes me want to wrap everything in orange stripes. 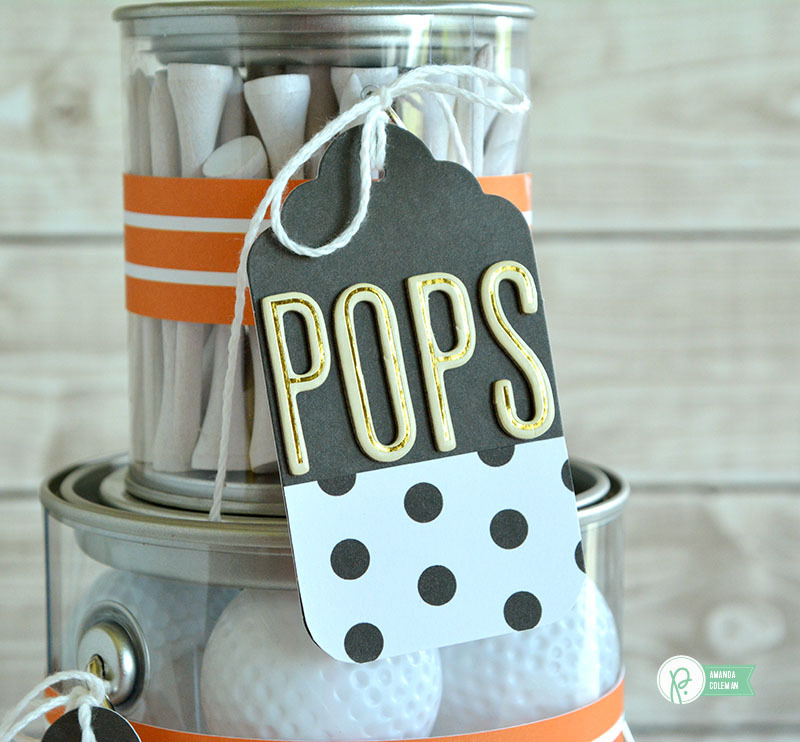 I knew that these cute black tags would compliment the bright orange stripes and white golf balls and tees, but the sentiments just weren’t right for a Father’s Day gift. What’s a girl to do? Cover the sentiments with a strip of coordinating patterned paper. Problem solved (and made extra cute)! Adhere a strip of patterned paper wide enough to cover the sentiment and trim away any excess. Hello everyone! Amanda here today with a quick (and inexpensive) summertime gift that you can put together in a snap. 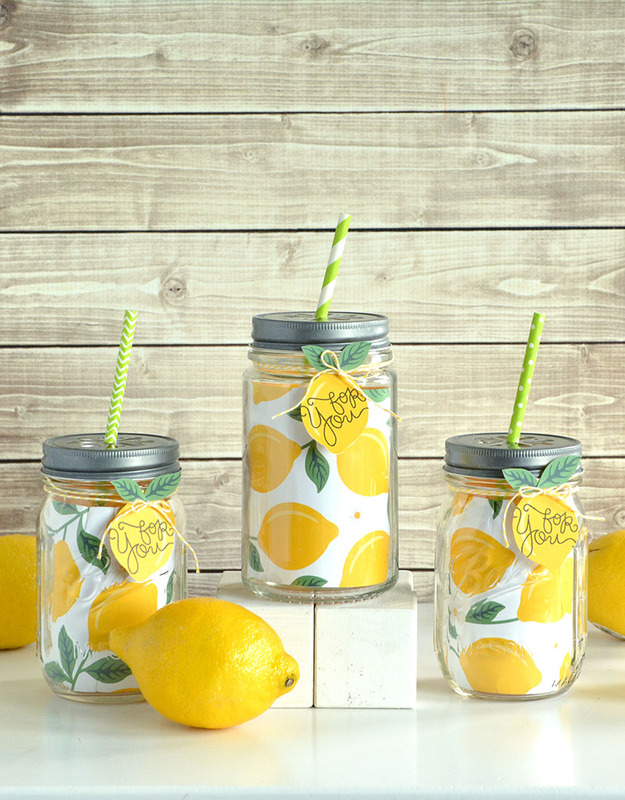 Nothing says summertime quite like a cold glass of lemonade. 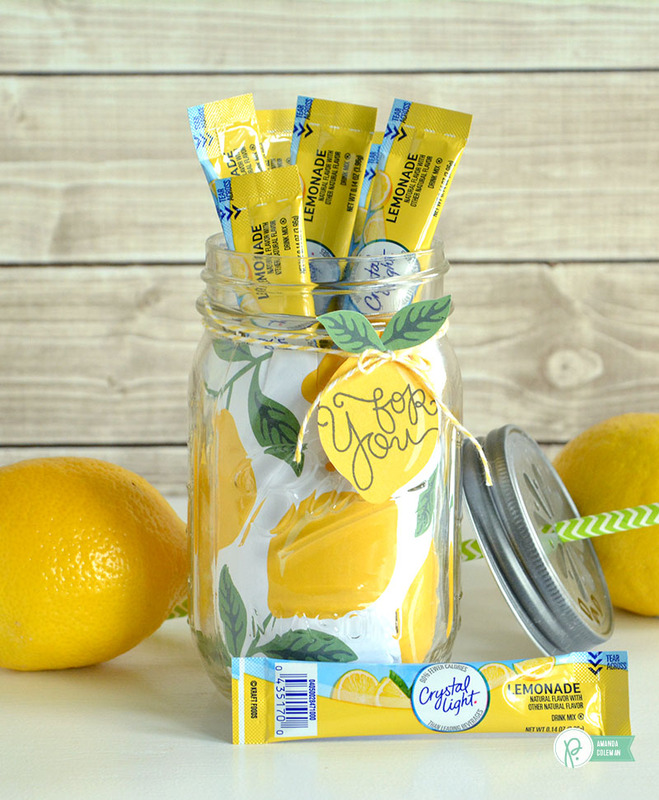 With a single sheet of lemon patterned paper, a mason jar, and your favorite lemonade mix, you can put together this sweet gift in no time. Whether for a celebration or just because, this sweet gift won’t disappoint. This mason jar pulls double duty. 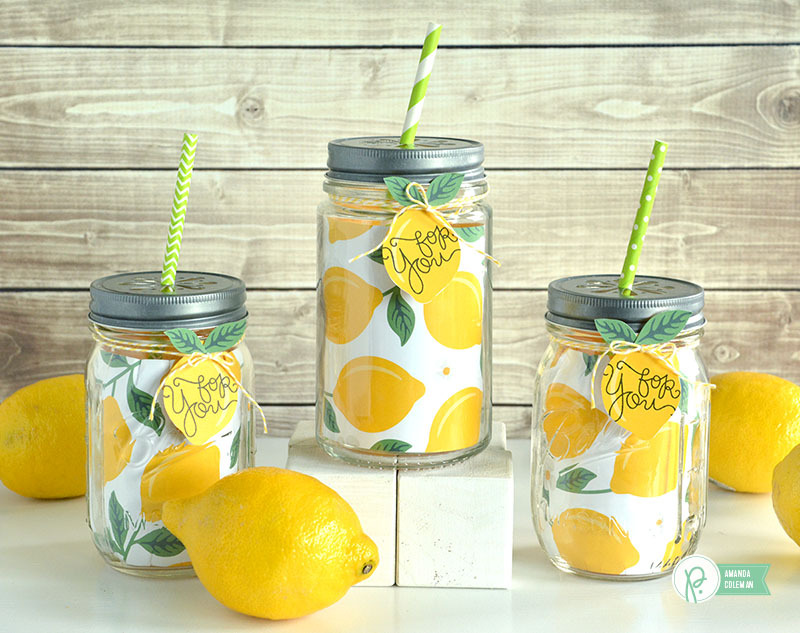 Not only can you fill it with single serving lemonade packages, but it can also be used to mix and drink the beverage. Double summertime cute. Lining the jar with paper is as simple as cutting a strip of paper that will fit the height of the jar. If your jar has curves, like the one above, use your fingers to pleat the paper on the top for a perfect fit. 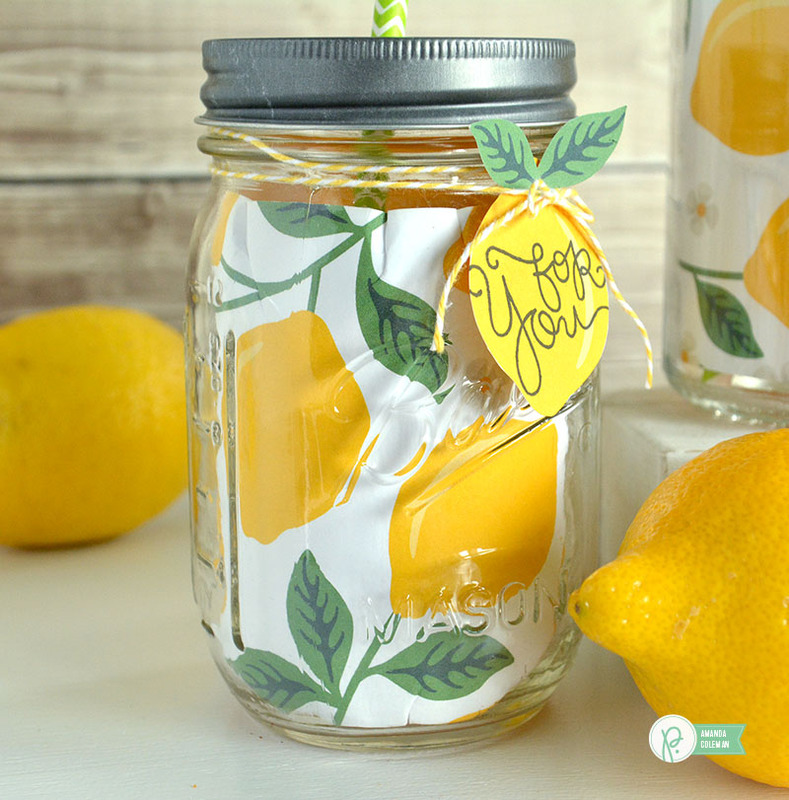 Don’t forget to remind the recipient to remove the paper before making or drinking lemonade from the jar. 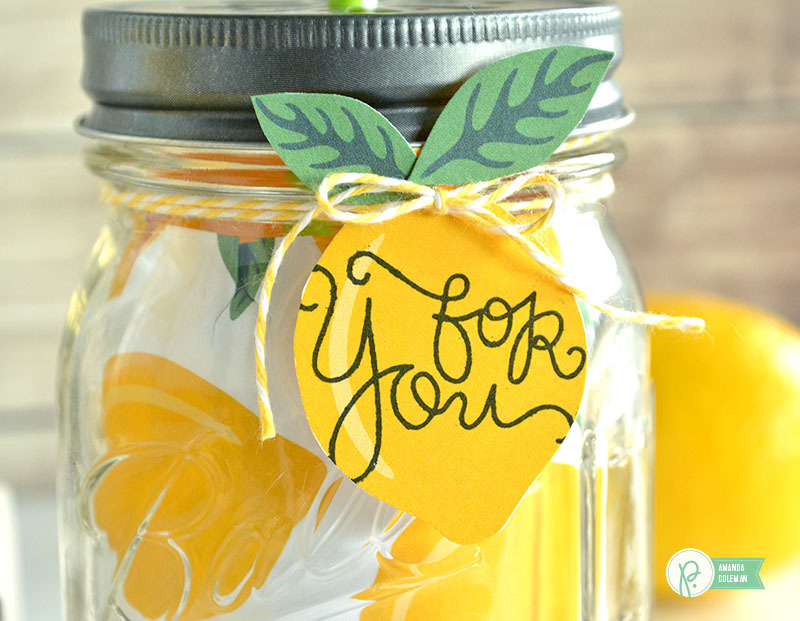 With a few snips of your scissors, you can create a custom lemon tag for your jar. Tie the tag to the jar with some pretty yellow baker’s twine and you have a new instant classic. 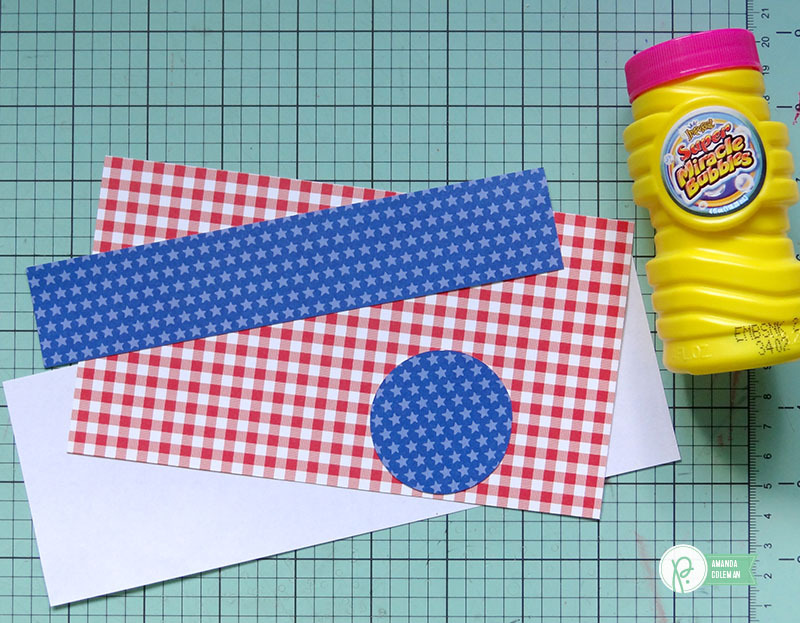 The lemons on the Honeycomb patterned paper are the perfect size for making a gift tag. 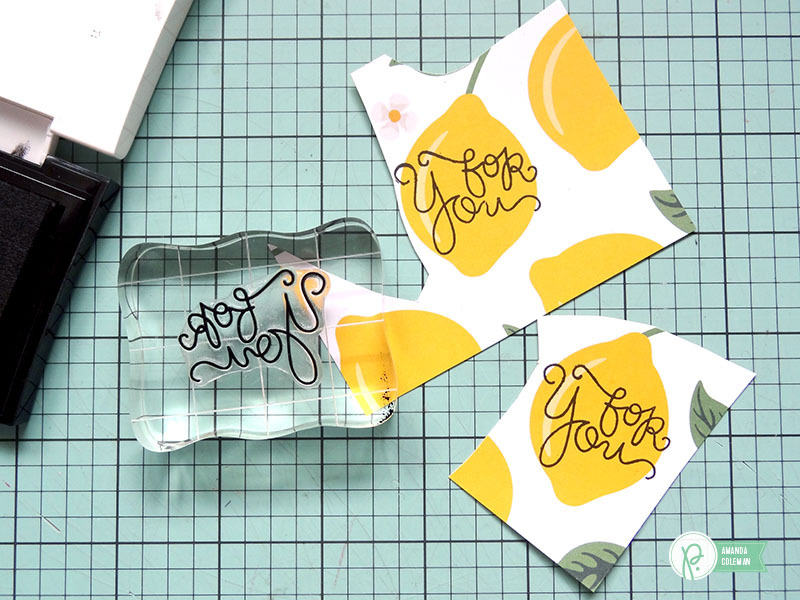 Ink up your favorite stamp to add the perfect sentiment and then fussy cut the lemon to make a sweet tag.